Moulded over with fungus, this is the result of leaving your Gemstone Trap unattended inside the Fungal Cavern for long periods of time. Providing a strange synergy with the crystals, the fungus growing along the gems on the trap spreads wildly. This surge of fungal energy is aimed at mice causing them to demolecularize into nothing more than fungus-enriched fertilizer. What a way to grow! The Fungal Gemstone Crucible Skin can be used on the Crystal Crucible Trap weapon. The trap's stats (power, power bonus, attraction bonus, etc.) are not changed. The Fungal Gemstone Crucible Skin can be purchased at the Fungal Cavern Trapsmith for 490,000 gold, 500 Cavern Fungi, 100 Nightshade, 1,000 Minerals, 50 Gemstones, 2 Diamonds, and 12 Crystal Crucibles. It can be refunded at the same location for 90,000 gold. The Fungal Gemstone Crucible Skin can be traded on the Marketplace or through Give To Friends. 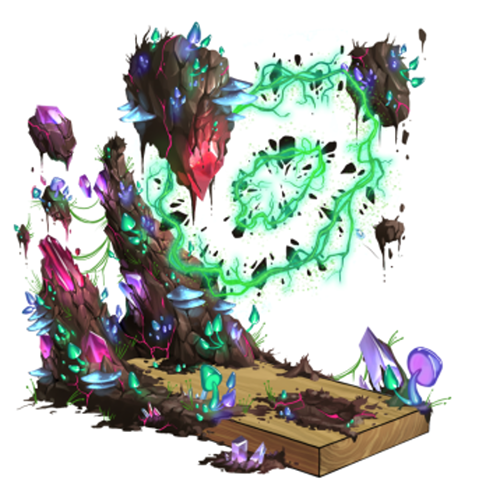 12 May 2015: The Fungal Gemstone Crucible Skin was released with the introduction of the Fungal Cavern. This page was last edited on 9 December 2017, at 12:01.